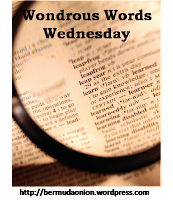 Wondrous Words Wednesday is a weekly meme hosted by Kathy aka Bermuda Onion where we share new (to us) words that we’ve encountered in our reading. Feel free to join in the fun. coloratura: runs, trills, and other florid decorations in vocal music. truculent: fierce; cruel; savagely brutal. What new words did you discover this week? Two great words! The character who used truculent must have been Southern. Thanks for participating! Coloratura sounds like a fun word to use. I believe I'm going to through out the whole sentence for truculent in conversation some time today. It sounds rather fun. Great words! Did not know what those meant, but have heard them before. Thanks for sharing. Have a great day! That's How I Blog with Me! That's How I Blog Tonight! My Secret Santa Came to Town! Bag Ladies Tea Novel Teas & Another Giveaway!